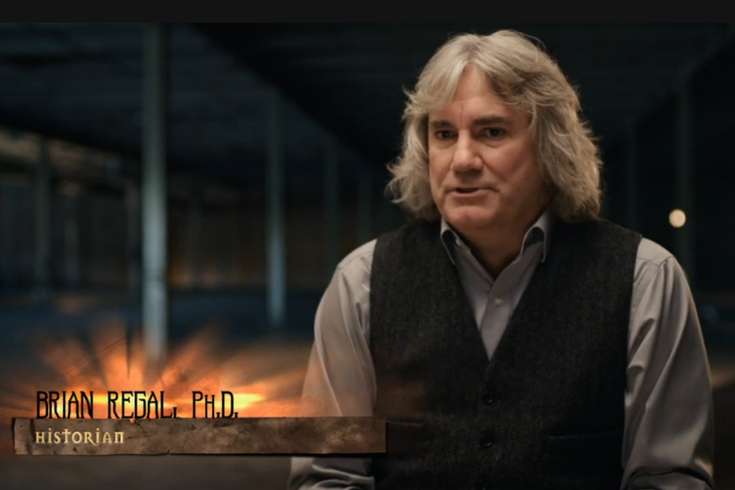 Historian Brian Regal, Ph.D., appears on History Channel's "True Monsters." The truth is out there, but according to one local expert, it’s just not as crazy as some of the more conspiratorially minded folks may think. Brian Regal is a Ph.D. from Kean University in Union, New Jersey, and the author of “Searching for Sasquatch: Crackpots, Eggheads, and Cryptozoology.” His areas of interest include human evolution, monster studies, pseudoscience, obscuranta and more. In other words, he’s a perfect fit for a Halloween Eve interview. Has the Jersey Devil been spotted? As such, he was a natural fit to lend a critical eye for the History Channel’s new series “True Monsters,” where he weighs in on, among other topics, the Jersey Devil. Regal spoke with PhillyVoice about his areas of interest and just why people shouldn’t believe in whimsical stories with no basis in fact. How did you find yourself studying the realm of monsters and myths? Was this something that you followed from your youth into academia? I was always interested in the strange and unusual. I did my doctoral dissertation on the life of Henry Fairfield Osborn and his quirky pseudo-religious views on human evolution. (This was also my first book.) While doing that research, I came across the world of monster hunters. I discovered that there was quite a bit of historical material on the topic that had never been accessed. I saw I could do an academic history of the field and tell the actual story. This became my most recent book, "Searching for Sasquatch: Crackpots, Eggheads, and Cryptozoology" (Palgrave/Macmillan, 2013). Last year, you spoke in Philadelphia about cryptozoology, which is defined as a “pseudoscience involving the search for animals whose existence has not been proven due to a lack of evidence.” I assume a room full of critical thinkers would be highly doubtful. Do you embrace that mindset or allow for suspension-of-disbelief possibilities? i.e. Are you the spoilsport in the word of whimsy? The Wall Street Journal once called me a "debunker," but I’m not that at all. I do not go out to disprove anything, not even the Jersey Devil legend. I’m an historian, and historians tell the story of the past so we can learn from it. The problem, from a monster enthusiast point of view, is that the stories I tell about the history of monsters and monster hunters are based upon a careful study of the primary sources rather than rehashing old, tired beliefs that have been propagated — often by people who should know better. As a result, the stories I tell undermine the popular versions. It’s all fun and games until the historian shows up. On "True Monsters," you serve as an expert commentator. Let’s talk Jersey Devil, which some people believe exists. You obviously disagree. Could it be real? Why isn’t it? Sorry, no, there is no Jersey Devil. There is no horse-like dragon flying around the Pine Barrens. I’m going to ask you to suspend disbelief and play devil’s advocate. If you could pick myths most likely amid doubtful fantasies to actually exist in reality, what would they be? How would you react if these things are, in fact, real? I guess it would be interesting if Bigfoot was real, or maybe werewolves, but there is no evidence they exist. Certainly not in any biological form. The "True Monsters" season finale, “Giants and Beasts,” airs tonight. What do you hope viewers take away from it? I hope viewers would get a better idea of what these legends are about, and maybe inspire them to do some research on their own. If this series gets people to look more carefully at the material and learn more, then it’s a success. It’s always better to live in a world of facts and reality, even if it goes against our beliefs, than to live in a world of superstition and fraud.